If you're a fan of film or a respectable human being, you know who Quentin Tarantino is - known for his trademarks of non linear storylines, stylistic violence and black humour which thrusted his debut Reservoir Dogs into the world of success, he has since become a trusted filmmaker in the big budget filmmaking sector, maintaining creative control over his personal projects even with huge budgets and all star casts tied to them - it's been three years since the renowned director brought us a genre film of epic proportions, but now he's back in business with his latest Western hit: Django Unchained. 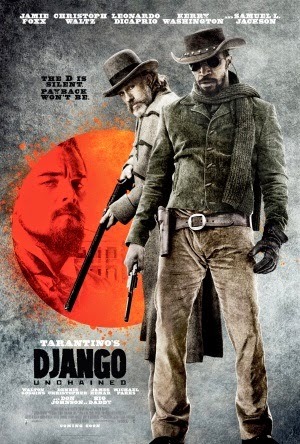 In 1858 United States, oppressed slave Django (Jamie Foxx) is freed from his ruthless owners by dentist turned bounty hunter Dr. King Schultz (Christoph Waltz) who requires Django's memory of the brutal Brittle brother murderers to fulfil a recent bounty. Following their success, Schultz hires Django as his bounty hunting assistant having freed him from slavery, eventually leading the two on a long rescue mission at the infamous Candyland plantation where Django's wife (Kerry Washington) remains a slave under the control of the charming but wicked Calvin J. Candie (Leonardo DiCaprio). Though modest with visual effects, Django Unchained still manages to be a damn fine looking film thanks to expert cinematography and stunning locations. The mountainous regions of the American South along with the expansive greenery of the Candyland plantation, or even the murky Western towns, capture the vibe of the genre perfectly and add up to a visually impressive project. It's all complimented too by a jazzy soundtrack, seamlessly blending an original score and established musical hits. At 165 minutes, Django Unchained is a monster and one that undeniably does not earn it's run time - the film is far too long and could quite easily be cut down by some 45 minutes due to so much squandering and drawn out conversational scenes. You might know that Tarantino is known for scenes of people talking which somehow manage to be exceedingly entertaining, but the effect doesn't consistently work in this film; things can feel unnaturally stretched, especially when it comes to the ending. Thankfully, the majority of Django is brilliantly crafted; it's funny as hell, hell bent on the comic violence and delivers more stunning characters from Tarantino, as well as a fantastic script full of rich dialogue. Jamie Foxx can feel a little bit dull as our eponymous badass, but the acting is also universally excellent - Waltz's performance rivals his stellar role from Inglorious Basterds quite easily and DiCaprio plays a villain ravaged in finesse and charm but with a brimming sense of cruelty dwelling inside. Django Unchained proves Tarantino is an expert at spanning multiple genres when it comes to his craft, and nobody does it quite like him. But as for his latest project, it's a less substantial and gripping effort than before and one that really doesn't know when to stop when it comes to wrapping up it's various plot elements. It's a great laugh and yields that signature Tarantino charm with excellent characters and eclectic dialogue, but the run time really takes it's toll and this lack of engaging material across a near three hour film can create the same effect in the audience. A strong effort, but not quite the masterpiece I expected.